I can't help but love this style of hair bow, and today's shop is full of them. I love the tips of each of the flower petals and how they curve up and at the same time the bow manages to still look... plump and lush. I always picture these bows clipped into the hair of girls with lush full dark curls, like a burst of spring nestled among the curls. I love this idea, even if I personally don't have the hair for it. Gardenmis on Etsy has a number of these bows in stock and a few other styles as well. The owner of a shop is a self confessed girly girl and loves all things vintage, handmade and just all around girly. Her shop is a testament to this with tons of beautiful girly bits and pieces to browse through. 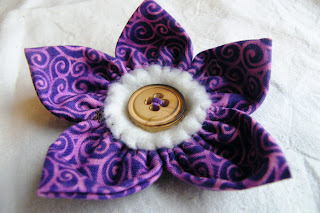 Gardenmis uses quality materials and repurposing/upcycling whenever possible in her hair bows (and occasional bits of jewelry as well!) and believes in going green and using less but making it count for more. She also does custom orders and all of her handmade items are one of a kind and many are hand-stitched with absolutely nothing mass produced. 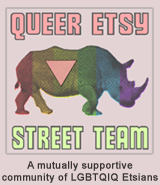 TO VISIT GARDENMIS' SHOP ON ETSY, YOU CAN CLICK THE PICTURE ABOVE OR, IF YOU'D RATHER, CLICK RIGHT HERE! How cool! I love seeing shops I've never visited before! Makes me wish I had a little girl to decorate! I love the bold colors! No little girls to keep busy with hair gadgets, but I have a little bit of an obsession myself... I'll have to check out the shop!